For longer than I’d like to admit, I have been advising on Clean Protocol based out of Australia. I say longer than I’d like to admit because it has taken so damn long to get to the point were meaningful forward progress has finally started. In anticipation of finalizing some key pieces of technology I wanted to reintroduce the reward side paradigm into the sports doping/ethics discussion. The fundamental premise is that statistically it is possible to identify a far larger subgroup of athletes who are very likely clean than very likely doped. More importantly, as I will sketch out below reward side anti-doping efforts will actually be complementary rather than competing with the current punitive side anti-doping efforts. 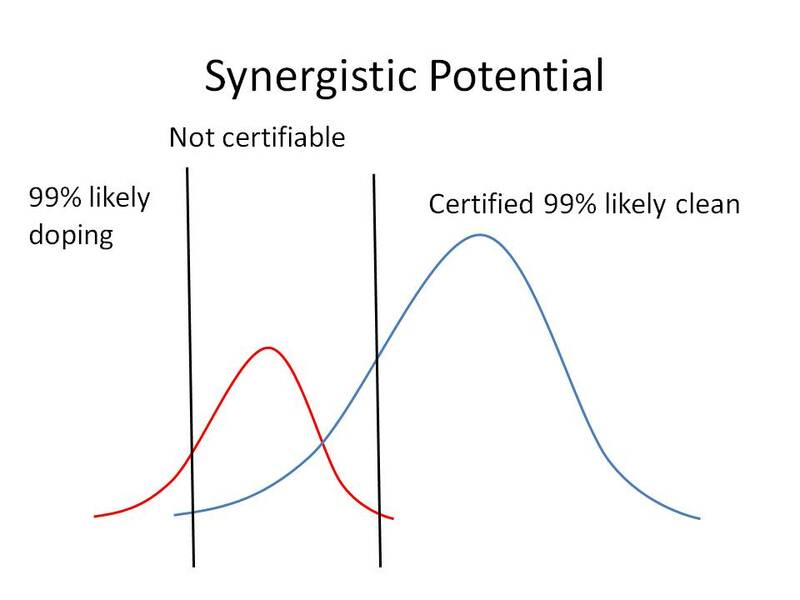 In the figure above, the larger blue curve represents the subgroup of about 70% of athletes who are truly clean. 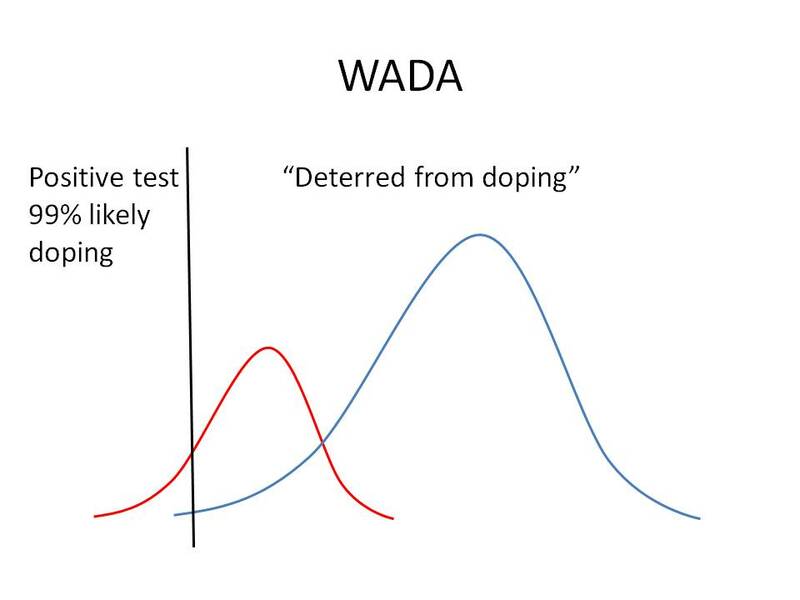 The red curve represents the subgroup of about 30% of athletes who are truly doping. The x axis represent the range of thresholds that can be set as a cut off between a positive and negative test. The curves are bell-shaped and overlapping to show the reality that there will never be a perfect test. Instead, any given threshold will always be a trade off between catching cheats and wrongly accusing clean riders. The current paradigm in anti-doping is a punish and deter model. Penalties are so harsh that testing thresholds have to be set very conservatively to minimize the chance of a clean rider suffering such a harsh penalty. Dr Larry Bowers of USADA (AMSSM 2013 presentation and personal communication) argues that while only a fraction of doped athletes are actually caught the system is still a strong deterent to high level doping. Without any modification to the current testing whatsoever, an alternative approach would be to take a reward side anti-doping model. Since the goal here is to reward clean athletes with an endorsement and no harsh penalties are involved, the thresholds can be shifted so that the vast majority of doped athletes are excluded. 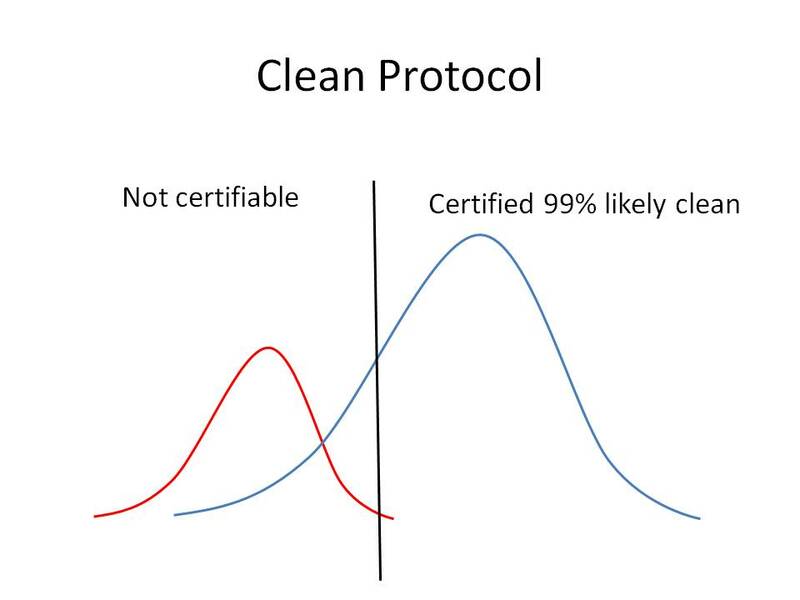 Under this approach the majority of clean athletes can be given the far less ambiguous endorsement of very likely clean. Such a designation would be far more likely to be embraced by fans. It would also provide sponsors with a far more secure investment. The potential issue of course, is if nobody is banned then individuals will be given the option to trade credibility for podiums. Fortunately, the punitive/deterrent and reward based models are not mutually exclusive. Instead, they are obviously quite complementary. By including both top down and bottom thresholds the greatest advantage can be had from the imperfect tests. As illustrated here, the very likely clean athletes can benefit from reward based endorsement, meaningful penalties can be kept in place, and the number of clean riders left in the “not positive” grey zone can be minimized.